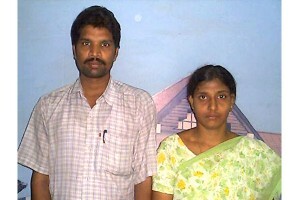 Biography: The ministry that Vinnakoti and Jyothi have birthed in India, Jesus Christ Gospel and Charity Organization, is a gospel outreach and social service organization that ministers to the poor, destitute and old-aged people of the area. The region is famous for Hinduism and idol worship. The focus of the church is leadership training, seminars, pastors' fellowship, orphanages, aiding the poor and evening Bible college. Vinnakoti and Jyothi lead many evangelistic projects which include church planting, ministry at the Children's Home, pastoral training classes, women's ministry, translation of books, gospel crusades, conferences and even open-air meetings. Strengths: Vinnakoti is a translator for missionaries and moves in the gift of prophecy. He is passionate about preaching and teaching the Word of God.